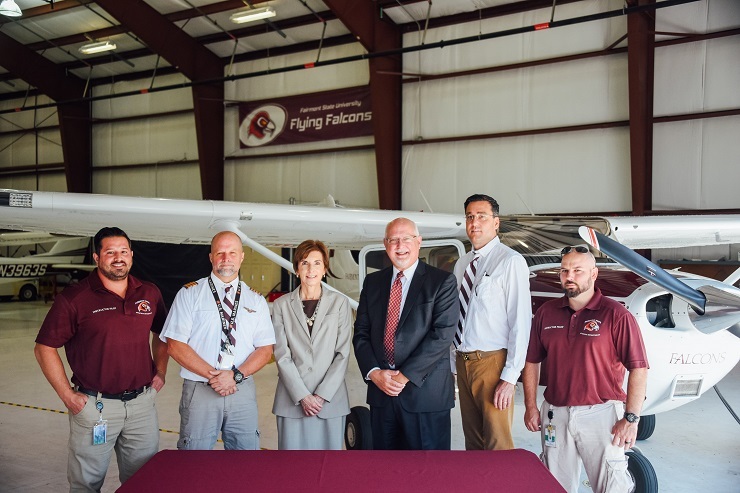 Fairmont State University and West Virginia University Institute of Technology have come together to reach new heights as they signed a consortial educational agreement that benefits aviation students at both institutions. The agreement allows students the ability to take classes from either program in order to complete their degree. Fairmont State Provost Dr. Richard Harvey said this is the first step in creating a college-based flight instruction aviation center at the facility in Bridgeport. While they are hoping to establish additional collaborations, this is a great starting point. “This means a tremendous amount for our institution and it’s an opportunity for us to have resources available to us that we don’t currently have as well as providing resources to Fairmont State that they don’t necessarily have,” said Dr. Joan Neff, WVU Tech provost. The agreement offers new opportunities to students on both campuses, Neff said, which will allow them to build a skill set that doubles what they might have had otherwise. Fairmont State University offers a Bachelor of Science in Aviation Technology with three speciality areas including aviation administration professional flight option, aviation administration management option and aviation maintenance management option. The University also offers an Associate of Applied Science degree in Aviation Maintenance Technology. Graduates who complete this degree meet all the prerequisites for taking the Federal Aviation Administration’s Airframe and Powerplant (A&P) Certification exams. Aviation courses are taught on site in Bridgeport. The center is FAA approved to administer all A&P certification exams on site. More information about the Aviation Technology programs through Fairmont State can be found by visiting https://www.fairmontstate.edu/collegeofscitech/academics/aviation-technology-program.